Cathay A350-1000 Completes Paint Job at Toulouse Facility. 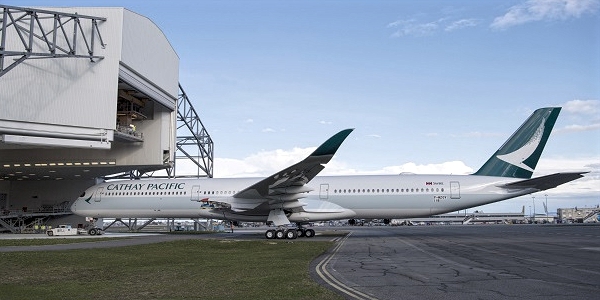 The first Airbus A350-1000 Cathay Pacific left the Toulouse paint shop after the livery's paint job. The Hong Kong operator expects to receive delivery of the first of its 20 -1000 in order by mid-year. He adds that the type powered by Rolls-Royce Trent XWB will form an "important part" of the airline's long distance operations. The plane will also be deployed on its new route to Washington Dulles in September, which will be the airline's longest flight. Cathay Pacific has been operating 22 A350-900 in service. It is planned to add 79 new aircraft to its fleet through 2024, which include 20 -1000, six -900, 32 A321neos and 21 Boeing 777-9.